Russia is pursuing a twin strategy to bolster ties with traditional partners like India as well as open new markets for its cutting-edge weapons. Russia ranks second in the world’s arms export. Moscow supplies arms and military equipment to 66 countries, has concluded agreements on military and technical cooperation with 85 countries and its portfolio of orders for defence-related products currently stands at a staggering $46.3 billion. Russian global arms exports reached $15.2 billion in 2012, up 12% compared to the previous year. Turkey: new focus market for Russian weapons? During 20 years Moscow has repeatedly tried to attract the Turkish military with its advanced technology. A new attempt was made at the IDEF 2013 exhibition. 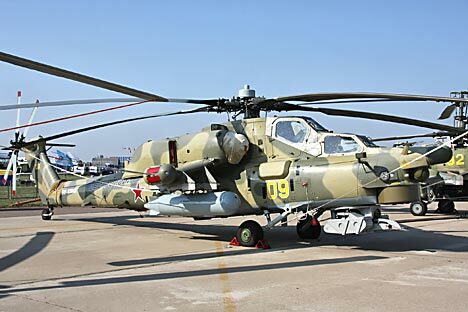 Russia presented its Ka-50-based Ka-52 Alligator attack helicopter and the Mi-28NE Night Hunter. The proposal to start joint development of a surface-to-air missile system with Ankara was perhaps the most intriguing development of IDEF 2013. The SAM would be based on the Russian S-300V Antey-2500 system. Besides the Antey, Moscow has offered the Buk-M2E and the Tor-M2E surface-to-air missile system, and the Pantsir-S1 combined missile and artillery system. Exhibited mock-ups included the T-90S tank, Terminator fire support combat vehicle, the BMP 3M infantry combat vehicle, the BTR-80 and the BTR-80A Armored Personnel Carriers, the Smerch multiple rocket launcher, the Kornet-E and the Metis M1 anti-tank missile systems, the Msta-S 152-milimeter howitzer, the Nona-S 120-milemeter self-propelled mortar, and the Vena self-propelled automated artillery system. Anatoly Aksyonov, the head of the Russian delegation and deputy CEO of Rosoboronexport, explained Russia’s massive presence at IDEF 2013 by the fact that Turkey was the first NATO member country to build close military and technical ties with Moscow. Anatoly Isaikin, the general director of Rosoboronexport, underlined that Ankara and Moscow have real opportunities for wider trade in military products. He, however, cautioned that one should not expect a major increase in the export of Russian weapons to Turkey. Russia’s arms exporters are also eying opportunities in the Latin American market. “According to our expert estimates, the volume of the Latin American arms market will reach about $50 billion in the next ten years. If we focus our efforts on this, corresponding contracts could be signed,” said Sergei Goreslavsky, representative of a Russian Technologies (Rostec) high-tech state corporation. He added that said Venezuela, Peru, Brazil, Argentina and Mexico were interested in buying helicopters and air defense systems. Grigory Kozlov, head of Helicopter Export Department at Rosoboronexport, said there is good potential for cooperation virtually with all the countries in the region, and especially with Brazil, where Mi-35M helicopters are successfully used. The main partner in the region is a traditional friend of Russia – Venezuela. It is now the second biggest purchaser of Russian arms, after India. The Center for Analysis of the World Arms Trade estimates the value of equipment acquired by Caracas from the Russian defence industry at $4.4 billion. This includes 24 Su-30MK2V fighters, 100,000 AK-103 machine guns, more than 40 Mi-17V-5 multipurpose helicopters, 10 Mi-35M2 attack helicopters, three Mi-26T2 heavy transport helicopters and 5,000 SVD sniper rifles. Russia and Peru will sign a contract to upgrade Lima's fleet of Mikoyan MiG-29 Fulcrum fighters by the end of May, Konstantin Biryulin, deputy head of Russia’s Federal Military-Technical Cooperation Service said on May 20. Peru is also considering buying 100 T-90S tanks. The country currently operates around 300 obsolete Soviet-made T-55 tanks, which Lima wants to replace with T-90S’s. Besides, Peru is interested in buying 700 Kamaz trucks and a new batch of Mi-8/17 helicopters from Russia. A source in the Russian government told the Izvestia on May 20 that Egypt terminated the contract with Russia for the creation of a 155-mm guided shell for the US M-109 howitzers, which are used by the Egyptian army, after its delivery scheduled was postponed nine times. As a result, Russia has lost one of the most promising weapons markets in the Middle East that is being actively developed by US companies. “The Egyptians are tired of waiting and last year the contract was terminated. The information was not disclosed in order not to spoil the image of Russian weapons”, said the source. Alexander Konovalov, director of the Institute for Strategic Assessments, says that the problem with the Egyptian contract arose because of the dumping of Rosoboronexport that was trying to return to the Egyptian arms market. The company still believes that the contract issue has not adversely affected the two countries’ military-technical relations. India remains Russia’s largest customer for weapons, buying 80 percent of its military hardware from Moscow. The country bought 350 T-90S tanks and ordered another 1,500. The INS Sindhurakshak, a diesel-electric submarine of the Indian Navy that underwent interim overhaul and modernisation at the Russian Severodvinsk-based Zvezdochka shipyard, finally arrived at the Mumbai port on April 29. The INS Vikramaditya has undergone a complex operation at Russia’s Sevmash shipyard ahead of the final stage of trials and delivery to the Indian Navy later this year. Russian aircraft producers seek opportunities to strengthen connections with their Indian partners. Sukhoi aircraft manufacturer is building a fifth-generation aircraft in conjunction with Indian partners. India is also currently operating 150 modern Su-30MKI multirole fighters. Rosoboronexport is participating in a tender to supply Ka-226T reconnaissance and surveillance helicopters, said Grigory Kozlov recently. Sergei Korotkov, CEO of Russian Aircraft Corporation (RSK) MIG, said his expectations are primarily related to the MiG-35: “I would like to see the MiG-35 continue to feature against the backdrop of our shared history and 50-year partnership. We expect India to consider the option of concluding a contract for the supply of the MiG-35, and we will be able to fulfil it." Moreover, Russia and India jointly develop BrahMos supersonic cruise missile. On May 22, according to Indian media reports, India successfully test-fired the 290km range BrahMos supersonic cruise missile from the Navy's latest guided missile frigate INS Tarkash off the coast of Goa. The article is a combined report based on materials from Rosoboronexport, RIA Novosti, ITAR-TASS, The Times of India.